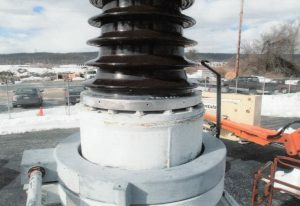 Figure 1 shows a repair of a base mounting flange leak on a Westinghouse 2300 bushing. The leak is between the porcelain and the base mounting flange. TDS has installed a two piece aluminum clamp over the leak. After installation the clamp is injected with our TDS proprietary rubber based sealant thereby fixing the leak.